Shadow Of The Colossus was broken, unpolished, and incomplete, and the upcoming remake shouldn’t try to fix that. 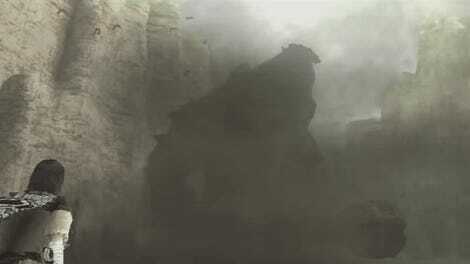 Technically, Team Ico did complete Shadow Of The Colossus. It shipped in 2005. You could put the disc in a PS2 and experience what would become one of the most iconic adventures in gaming. But a much more sprawling vision for its world, and the colossi that would inhabit it, was never realized. Thanks to technological constrains and limited time, large swaths of the game remained hidden away unfinished, or cut out entirely. After Sony revealed at this E3 that the game would be making the jump to PS4 in 2018, the company’s President, Shuhei Yoshida, confirmed to Famitsu that it would be more than just a remaster. Specifically, he noted that it might include updated controls, and that designer Fumito Ueda was not much involved in the new project. So if Bluepoint, the development company behind the game’s PS3 HD port, will potentially be updating not just the look but also the controls, why not go even further and try to partially restore the game to what Team Ico first envisioned it might be? Shadow of the Colossus as it exists today only has sixteen colossi. Some of them are more memorable than others, but all have been killed millions of times. The game even includes time trials to reward players for finding unique and innovative ways to go about doing it. One player has even managed to complete all of them on hard in under an hour. There used to be more though back when Team Ico first started working on the game. Not surprisingly, given what we know about him now and the ungodly amount of time Last Guardian spent in development, Ueda had planned for up to 48 different hulking bosses to be roaming about the game’s map. Based on interviews, concept art, and the game’s code combed over by ravenous fans, we know that some of these colossi looked similar to ones that ended up making the final cut, while others, like this giant spider, were quite distinct. One of the game’s more famous players, who goes by Nomad, compiled a thorough investigation of the matter on his blog several years ago. 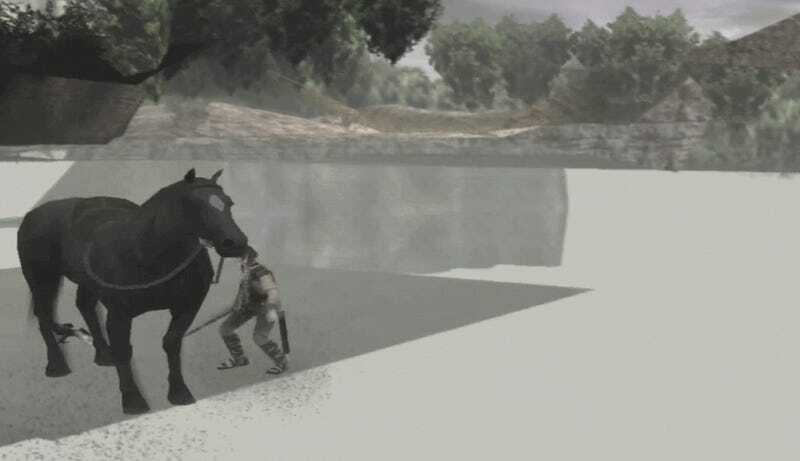 Part of a large group of colossi hunters searching desperately to unearth every last available secret in the game, Nomad and others helped demonstrate not just that this stuff exists, but what was so compelling about the underlying game to make people go looking in the first place. Shadow of the Colossus has all the markers of a cult classic but it’s not one. Roger Ebert talked about it, sparking a decade-long collective migraine about the relationship of video games to art. Adam Sandler and Don Cheadle played it in a major motion picture. And it’s not hard to see why. The game’s appeal transcends gaming and is immediately obvious, with an ambiance that’s both contemplative and intimate by virtue of how open and hands off the world is. People like wandering across a valley toward a mountain only to realize that mountain is alive and has just noticed them. 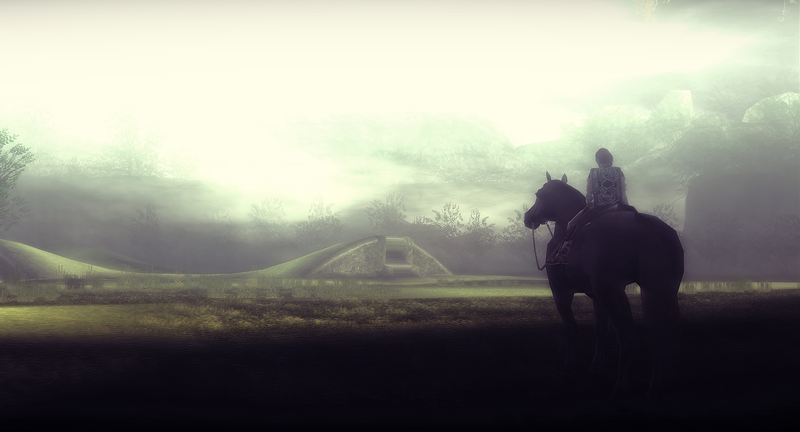 You don’t have to beat Shadow of the Colossus or even be good at it to be taken in by the mysteries embedded in its geography. What are these crumbling ruins? What kind of previous civilization do they hint at? And why do some of them move and try to kill me? Aided by the game’s penchant for silence and its minimal exposition, as well as an ending whose twist is just the right mix of irony and ambiguity, its easy to let these lines of questioning take over, and be driven forth by them into the unknown. Fortunately for the millions of us who originally fell under that spell, the maze was never finished, and so we as a result never had to be finished with it. The original Shadow of the Colossus is rife with glitches. Some appeared the result of tight (by Ueda’s standards) production schedules and a challenging QA process, while others almost seemed intentional, as if the game’s creators were gesturing toward another level of mysteries below the game’s surface. Birds you could hop a flight on, a lake that didn’t obey the normal laws of physics, and a secret garden atop the game’s central tower players spent years trying to ascend—they all helped extend the life of the game and resisted pat interpretations of its meaning and the designers’ intents. Who creates a door that can’t be opened and then taunts players with it? 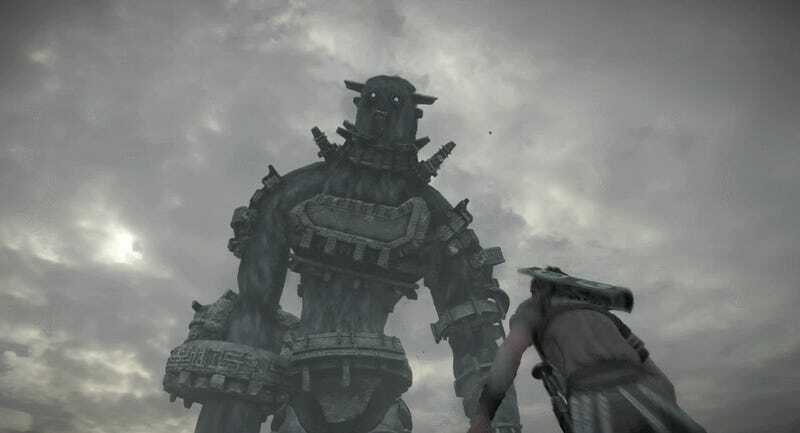 The best ruins in Shadow of the Colossus are the ones left there by the artists themselves and which players have spent over a decade struggling with. A remake as beautiful looking as the one Sony showed at E3 can enhance the details on every tree and replace a hellish third-person camera with a control scheme less rage-inducing, but it’s not likely to find a way to recapture the magic of playing a game filled with mysteries it never intended to create in the first place.